Yes. Naturalized in California and South Africa, as well as New Zealand. [Anonymous] (2012). Invasive Species South Africa. 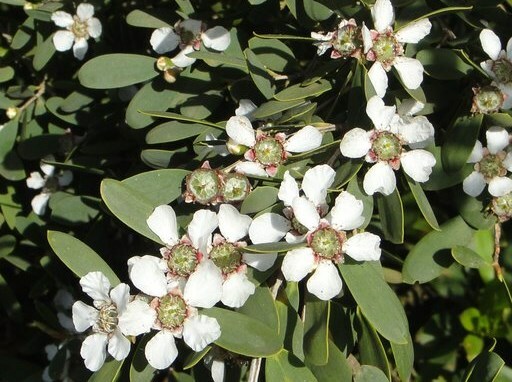 This species has naturalized in 11 counties in California (Calflora), mostly along the coast. The areas in South Africa that have occurrences in GBIF as well as the areas described by the Invasive Species South Africa site match California's climate. It is listed as a problematic invasive species in South Africa, and has specific regulatory legislation regarding its status. It is not reported to be present anywhere else in the US beyond California. It is listed as a problematic invasive species in South Africa, and has specific regulatory legislation regarding its status. In California, DiTomaso and Healy note this species under non-native rarely naturalized species, indicating that it is an ornamental escape in disturbed coastal areas. Leptospermum scoparium is considered invasive in areas that do not match California's climate. L. petersonii is considered a minor/potential environmental weed in New South Wales, but the distribution is more coastal than the climate match area. Several other Leptospermum species in Randall that have sources for "environmental weed" status (L. ericoides (=Kunzea ericoides, GISN), L. polygalifolia, L. rotundifolia, and L. scoparium), but on examination only Kunzea ericoides could be confirmed to be invasive in an area that matches California's climate, in a preserve NE of Melbourne, in Victoria, Australia (GISN). Australia's Virtual Herbarium (0). Australia's Virtual Herbarium. Global Invasive Species Database, Invasive Species Specialist Group, Global Invasive Species Programme (GISP) (2006). Global Invasive Species Database. The native distribution in Australia (using AVH) contains some areas that match California's climate: the western tip of Western Australia and the coast of South Australia. However, most of the areas in coastal Victoria, New South Wales and Queensland as well as the range within north and east Tasmania do not match California's climate. Within the naturalized range, the areas with GBIF occurrences in New Zealand do not match California's climate, but the areas of occurrences in South Africa in the Western and Eastern Cape, as well as the California coast do match California's climate. Because much of the native range does not match, being more coastal than the climate match areas, I am giving this a "no." Indicated to form dense stands and outcompete and replace native species in South Africa. Even within its native range in Australia, it is noted to be aggressive, spreading into natural areas and forming dense stands. Bennett, LT. (1994). The Expansion of Leptospermum laevigatum on the Yanakie Isthmus, Wilson's Promontory, Under Changes in the Burning and Grazing Regimes. Australian Journal of Botany. 42, 555–564. Cheal conference paper notes that this species changes fire regimes in Australia (note full text of this citation is unavailable; exerpt from the PIER assessment), as well, the Burrell paper notes that this species is increasing in communities where it was not as abundant and although this species is killed by fire, prolific seeding follows, leading to a dense thicket susceptible to reburning. Cheal, D. (1996). Fire succession in heathlands and implications for vegetation management.. Biodiversity and Fire: The effects and effectiveness of fire management.Proceedings of the conference held 8-9 October 1994..
Cattle are known to graze on this species. Noted to produce "thickets" and "impenetrable stands." Burrell, JP. (1981). Invasion of coastal heaths of Victoria by Leptospermum laevigatum (J. Gaertn.) F. Muell. Australian Journal of Botany. 29, 747–764. Sources indicate reproduction by seed. PIER assessment indicates "no" to this question (but notes a source as mentioning horticultural propagation by cuttings, as is common for many many plants), and that there is no evidence that this is a natural mode of reproduction. Bennett indicates that this species is killed by fire and does not reproduce vegetatively. Sources indicate reproduction by seed. Note that the PIER assessment indicates "yes" to this question, but notes the source as mentioning horticultural propagation by cuttings, and that there is no evidence that this is a natural mode of reproduction. Yes reproduction is by seed, and experiments using seed indicate easy germination of wild-collected seed. Although the species may produce seed each year, and it may be numerous, it is held serotinously on the plant until fire releases it from capsules, taking up to 5 years. It is noted therefore by Bennett that fire intervals <5 years disadvantage this species, as it takes at least that long to grow to maturity and set seed. That said, HEAR indicates "yes" to this question, citing several sources that list "prolific" seed production in the thousands. In the spirit of the question, I believe the interpretation here should be "no" as either this Q14 or Q15 needs to indicate that the plant does not set seed that can produce seedlings annually, and this species requires fire. The relevant section from Bennett is included for the benefit of the reviewer as an exerpt in the bibliographic section. Comment from Denise Knapp: I agree that Q. 14 & 15 are difficult to interpret for this species, and the answer should be yes for one of the questions and no for another. But I think this question should get a Yes, and Q. 15 should get a No. The plant is producing viable seed each year, but the fruit requires heat to open and disperse seed. The seeds also may need other germination cues (heat, smoke, etc. ), but those are separate factors from viability. As above in Q14, there is some limit to when seed is set, which is that it is released following fire, and requires an age of >5 years to achieve seed set at all. The questions don't align well with the life history of this serotinous species, so either Q14 or this one needs to be "no." Although the species may produce seed each year, and it may be numerous, it is held serotinously on the plant until fire releases it from capsules, taking up to 5 years. It is noted therefore by Bennett that fire intervals <5 years disadvantage this species, as it takes at least that long to grow to maturity and set seed. That said, HEAR indicates "yes" to this question, citing several sources that list "prolific" seed production in the thousands. In the spirit of the question, I believe the interpretation here would be "yes." The relevant section from Bennett is included for the benefit of the reviewer as an excerpt in the bibliographic section. Comment from Eric Wrubel: I believe the answer to this question should also be No. As stated above (Q. 14), this is a serotinous species that requires fire to disperse and germinate. Therefore it is a species that requires an infrequent environmental condition to germinate, i.e. fire. The criteria state that the objective of this question is to determine if the species can establish quickly after it has escaped by germinating large amount of seed quickly, rather than waiting for fire or etc. Bennett indicates that the species requires 5 years to produce viable seed, but other sites indicate 3 or so. Agricultural Research Council (0). One-Page Fact Sheets on Invasive Alien Plants (Terrestrial). Plant requires infrequent conditions (fire or felling) to set seed. Comment from Denise Knapp: This question is about the annual duration of seed production, not dispersal or germination. I believe the answer should still be no, based on the reported bloom period of "spring", in the Jepson Manual, and the San Marcos Growers website. Since the species flowers for < 3 months, it can be inferred that annual seed production is < 3 months duration. Although there are no specific structures listed, the seeds are described as light and several sources cited in HEAR assessment list wind dispersal. Florabase lists dispersal vectors: "wind, vehicles, soil movement, water, garden refuse." A conference paper also confirms common dispersal from these vectors. Lam, A., & van Etten E. (2002). Invasion of indigenous vegetation in south-western Australia by Leptospermum laevigatum (Myrtaceae). Thirteenth Australian Weeds Conference. Coleman, H., Brown K., & Bettink K. (2014). FloraBase: The Western Australia Flora. Reviewed by Ramona Robison, Eric Wrubel and Denise Knapp.